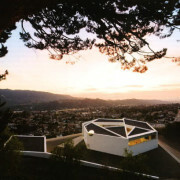 LA Times Blog: Blu Dot, the Minneapolis-based home design company with a store on Melrose Avenue in L.A., sponsored the panel discussion along with Skid Row Housing Trust, which develops and manages apartment buildings that provide permanent housing for the formerly homeless. LA Times: Residents of apartments operated by the Skid Row Housing Trust studied storytelling, learned public speaking — all with the aim of sharing what it’s really like to be living on the street. 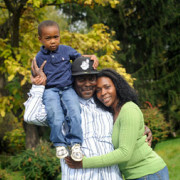 Pittsburgh Tribune Review: Tyrone Taylor picked up his grandson at his daughter’s Penn Hills home Monday and gave thanks to God, a day after returning to Pittsburgh from California, where he had spent 20 years homeless and addicted to drugs and alcohol. 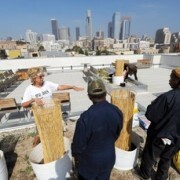 LA Downtown News: On a recent Wednesday, Willie Mae Bell was dripping with sweat under a harsh mid-morning sun. She was on the roof of her building, preparing to plant potatoes in a garden. 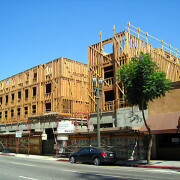 DTLA Rising with Brigham Yen: The LEED-Platinum certified New Genesis affordable housing mixed-use project has been rising quietly on Main Street over the past year. A rendering from architect firm Killefer Flammang shows a well-designed, modern 7-story building that will contain 106 units intended as supportive housing, mostly for the formerly homeless in the area, and 25% of the units will go toward working individuals making less than $37,260 annually. 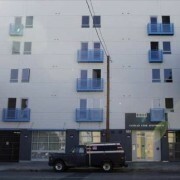 ICON: The New Carver apartments stand on the corner of Hope street in Downtown Los Angeles. It’s a white, round building that seems to have come undone in places. Apart from its proximity to Interstate 10, there is little unusual about this block of flats – an architectural monolith in an up-and-coming area of LA. That is, until you step inside. 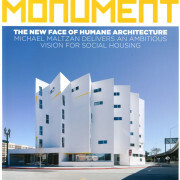 Monument Magazine Issue 102: Michael Maltzan delivers an ambitious vision for social housing.